Robust integration brings compliant pricing to cloud-based digital mortgage lending platform. Plano, TX (April 9, 2019) – Optimal Blue, the leading provider of secondary marketing automation and services in the mortgage industry, announced today the certification of the integration with Blue Sage Solutions’ sophisticated, multi-channel digital lending platform. Through multiple seamless integrations with Optimal Blue’s product eligibility and pricing platform, Blue Sage now enables wholesale, correspondent, and retail lenders to receive real-time, compliant pricing scenarios regardless of their business channel. San Francisco, CA and Englewood Cliffs, NJ – March, 2019 – Capsilon a leading provider of digital mortgage solutions, has partnered with Blue Sage, the mortgage industry’s only browser-based, end-to-end mortgage platform, to automate key steps in the loan origination process. Englewood Cliffs, NJ and Grand Rapids, MI – February 5, 2019 – Blue Sage, developers of the mortgage industry’s only browser-based, end-to-end digital lending technology built with modern technology and designed to provide borrowers with a digital mortgage experience, announced that Member First Mortgage, a credit union service organization (CUSO), has chosen Blue Sage as its mortgage origination platform. Member First Mortgage provides a complete range of conventional and government loans and performs loan processing, fulfillment, servicing and other mortgage-related services for more than 200 credit unions nationwide. All mortgages originated on behalf of Member First Mortgage’s credit union members will be created through the Blue Sage Digital Lending Platform, a browser-based, highly scalable solution capable of supporting any mortgage channel, including retail, wholesale and correspondent lines of business. Built, managed and delivered through a cloud environment, Blue Sage can be accessed on any device and handles pricing, underwriting and loan decision-making from the point-of-sale stage all the way to the closing and funding of a loan. The decision to use Blue Sage was made following an extensive search and review of competing loan origination platforms, Member First Mortgage CEO Jerry Reed said. From a borrower perspective, Blue Sage will be instrumental in helping credit unions attract and serve younger members, Reed added. The Blue Sage platform comes equipped with borrower facing loan application tools that enable credit union members to manage their own mortgage experience. After a borrower applies for a loan online, Blue Sage automatically calculates fees and creates electronic disclosures that are then sent to the borrower for e-signing, saving valuable time and effort. All vendor services—such as appraisals, title and flood insurance—can be automatically ordered online through Blue Sage’s workflow as well. Blue Sage is an innovative, cloud-based digital lending platform for retail, wholesale and correspondent lenders that provides a superior lending experience for every borrower. The company’s technology is 100% browser-based and provides end-to-end functionality for the entire lending and fulfillment process, regardless of channel. All Blue Sage solutions include mobile applications and are delivered through a secure, fully managed cloud service. The company’s technology was developed over the past four years by the founders of Palisades Technology Partners, developers of Impact, the first end-to-end web-based loan platform which was used by five of the 10 largest U.S. originators. Blue Sage Solutions is headquartered in Englewood Cliffs, New Jersey. For more information, visit www.bluesageusa.com. Built on the Credit Union philosophy of “People Helping People,” Member First Mortgage (MFM) is a nationwide credit union service organization (CUSO) that has served the home financing needs of more than 200 credit unions and individual borrowers since 2001. Based in Grand Rapids Michigan, Member First Mortgage offers a wide range of mortgage programs and services, from purchase, refinance and construction. For more information visit www.memberfirstmortgage.com. CoreLogic is exiting its loan origination software and default management operations over the next 24 months and instead accelerated plans to transform its appraisal management company unit. Those two noncore businesses generated approximately $40 million in revenue in the first three quarters of the year, the company said in a press release. The appraisal management business had $65 million in revenue over the same period. However, this change will result in lower revenue for CoreLogic during 2019. CoreLogic’s adjusted EBITDA was $128 million in the third quarter, down 7% from the year prior, driven by reduced U.S. mortgage loan unit volumes and lower appraisal revenue, among other things, the company’s third-quarter earnings release said. The adjusted EBITDA margin for the quarter was 28%; for the same period in 2017 it was 29%. When the LOS first came to market, many considered Dorado’s cloud computing, automation and highly custom capabilities ahead of their time in the mortgage industry. But those cutting-edge features often required lengthy and costly implementations that were out of reach to all but the largest lenders, like JPMorgan Chase. But the larger and more sophisticated institutions that could actually benefit from Dorado’s advanced features were often wary of doing business with a small startup like Dorado. CoreLogic’s outright acquisition of Dorado in 2011 was supposed to overcome that obstacle by providing the balance sheet support of a mega-vendor. Dallas-based PrimeLending was one of the few lenders still using Dorado, but recently announced plans to implement a new LOS from Blue Sage Solutions, a New Jersey-based startup founded by Carmine Cacciavillani. The mortgage technology veteran previously founded Palisades Technology Partners, which was acquired by IBM in 2006. CoreLogic’s more recent deals have been focused on the appraisal business. The company acquired a la mode back in April for $120 million, and that followed the 2017 purchase of Mercury Network for $153 million. Before that, it acquired FNC, bought out Wells Fargo’s interest in the RELS joint venture and acquired LandSafe Appraisal Services. Steve Smith and Finicity are helping to lead an industry-wide transformation in underwriting, away from manual and toward digital. Smith co-founded Finicity and serves as the company’s CEO. Finicity developed and deployed a variety of products for the mortgage lending industry, Vanguard logoincluding the company’s Verification of Assets and Verification of Income solutions. According to the company, digital verification has the potential to cut the underwriting process from as many as 70 days to 10 days, while making it easier on both the borrower and the lender. Over the past 12 months, Finicity announced integrations of its asset verification solution into the digital lending platforms of 11 key industry players: Capsilon, SimpleNexus, Lender Price, Mortgage Cadence, Blue Sage, BeSmartee, Ellie Mae, Advanced Data, MortgageHippo, Black Knight and DataVerify. And the company expects more of these types of arrangements to come in the near future. Finicity was also chosen to participate in Fannie Mae’s pilot for Single Source Validation, which is an enhancement to the Desktop Underwriter validation service that leverages bank account data collected via a single asset report to validate income, assets and employment. Finicity inked direct data exchange agreements with two major banks: USAA and Capital One. Last year, the company signed similar deals with Chase and Wells Fargo. Finicity was honored as one of the 2018 HW Tech100, an award reserved for the housing industry’s top technology companies. What has been your secret to success? Digital lending technology company Blue Sage announced that PrimeLending has selected Blue Sage Digital Lending Platform as its new mortgage origination platform. Blue Sage’s Digital Lending Platform is a completely cloud-based, scalable solution capable of supporting any mortgage channel, according to the company. “We are laser-focused on delivering the best mortgage experience and, in our opinion, Blue Sage gives us a tremendous advantage now and in the future,” said Tim Elkins, CIO, EVP of PrimeLending. Blue Sage, Englewood Cliffs, N.J., announced that PrimeLending chose its Digital Lending Platform as its new mortgage origination platform. The Blue Sage Digital Lending Platform is a cloud-based, scalable product capable of supporting any mortgage channel, including retail, wholesale and correspondent lines of business. The platform handles pricing, underwriting and decision-making from the point-of-sale stage all the way to the closing and funding of the loan. The Blue Sage Digital Lending Platform is a completely cloud-based, highly scalable solution capable of supporting any mortgage channel, including retail, wholesale and correspondent lines of business. The Blue Sage Digital Lending Platform is event-driven. The platform handles pricing, underwriting and decision-making from the point-of-sale stage all the way to the closing and funding of the loan. Because Blue Sage can be easily integrated with third party services due to its APIs and integration options, an unlimited number of third party vendor services, such as appraisals, title and flood insurance can also be ordered online through the Blue Sage platform. Blue Sage also includes mobile applications and CRM tools geared to helping loan officers increase sales. Mortgage lender PrimeLending is now using the Blue Sage Digital Lending Platform as its origination platform. The platform is highly scalable and capable of supporting any mortgage channel, including retail, wholesale and correspondent lines of business, Blue Sage says in a release. Its user-friendly process automation tools will help PrimeLending’s loan officers capture greater numbers of borrowers seeking a digital mortgage experience. Last year, PrimeLending, a PlainsCapital company, originated more than $14.5 billion in mortgage loans. Built on a modern technology stack, Blue Sage’s platform is highly event-driven, handling pricing, underwriting and decision-making from the point-of-sale stage all the way to the closing and funding of the loan. The platform sports a rich set of APIs and integration options, enabling it to be connected with a wide range of third party software and vendor services, such as appraisals, as well as title and flood insurance. Blue Sage also includes mobile applications and CRM tools geared to helping loan officers increase sales. $14.5 B lender’s decision follows rigorous vetting process that included competing LOS products. PrimeLending expects Blue Sage’s user-friendly process automation tools will help loan officers capture greater numbers of borrowers seeking a digital mortgage experience. Englewood Cliffs, NJ – October 14, 2018 – Blue Sage, developers of the mortgage industry’s first browser-based, end-to-end digital lending technology, announced that PrimeLending, a PlainsCapital Company and top 10 mortgage lender1 that originated more than $14.5 billion in mortgage loans last year, has chosen the Blue Sage Digital Lending Platform as its new mortgage origination platform. Built on a modern technology stack by a proven team of experienced mortgage technology professionals, the Blue Sage Digital Lending Platform represents the peak of process automation available in the mortgage industry today. Highly event-driven, the platform handles pricing, underwriting and decision-making from the point-of-sale stage all the way to the closing and funding of the loan. Because Blue Sage can be easily integrated with third party services due to its rich set of APIs and integration options, an unlimited number of third party vendor services, such as appraisals, title and flood insurance can also be ordered online through the Blue Sage platform. Blue Sage also includes mobile applications and CRM tools geared to helping loan officers increase sales. PrimeLending, a PlainsCapital Company, is a leader in home lending, combining personal guidance and local expertise with fast service, more choices and the flexibility to meet homeowners’ unique needs. We’re a Top 10 national home lender focused on empowering our customers to pursue their homeownership goals. Whether they’re looking to buy, refinance or renovate a home, the PrimeLending team works alongside our customers in all 50 states, helping them make home financing decisions and have a rewarding experience along the way. Delivering on this promise for more than 30 years, we’re proud to consistently earn a 96% customer satisfaction rating2. PrimeLending is a wholly owned subsidiary of PlainsCapital Bank, which in turn is a wholly owned subsidiary of Hilltop Holdings Inc. (NYSE: HTH). More information at www.PrimeLending.com. Equal Housing Lender. 1. Survey administered and managed by an independent third party following loan closing. 96% satisfaction rating refers to the rating our customers give our loan officers. Our loan officers have received a 96% Customer Satisfaction Rating.2. As reported by Marketrac, powered by CoreLogic® for purchase units nationally for 2012-2017. Docutech’s integrations with leading technology providers in the mortgage and consumer lending industry are key to helping us deliver end-to-end solutions that enable lenders to streamline loan origination, reduce costs, and optimize the experience for the borrower. In our monthly Industry Spotlight blog series, we highlight key relationships that help us move the industry forward by delivering the most streamlined, accurate, compliant and innovative document experience possible. This month, we sat down with Blue Sage, a digital lending platform that works with lenders to deliver a digital mortgage experience within the web browser via any channel. Blue Sage is working with Docutech to combine their digital capabilities with smart document and eSignature technology to move as much of the loan process as possible to a digital environment. What innovative services is Blue Sage providing to financial institutions?The Blue Sage Digital Lending Platform is 100% browser-based and covers the entire lending and fulfillment process, regardless of channel. It delivers everything from product pricing to underwriting and decision-making from the point-of-sale stage all the way to the closing and funding of the loan. Because it’s delivered through a secure, fully-managed cloud service, the platform enables lenders to achieve speed and compliance with fewer costs. With Blue Sage, borrowers no longer must print, fax and mail paper documents to their lender, often repeatedly and at the last minute. For example, Blue Sage’s consumer applications offer full chat, remote assistance and automated workflows, enabling borrowers to search and apply for mortgages at their own pace or with assistance from a loan officer when needed. It also comes equipped with consumer-facing desktop and mobile applications. By putting the primary focus on customer satisfaction, we’re helping lenders increase repeat business and referrals. How does your integration with Docutech help deliver an outstanding experience to the institutions you work with? Blue Sage and Docutech are teaming up to provide a higher level of automation to our mutual clients. Together, we’re saving lenders from performing an enormous number of manual tasks that have led to the highest per-loan costs our industry has ever seen. Specifically, we have built a seamless integration to Docutech’s eSignature platform, Solex, which provides borrowers with an intuitive, easy-to-use eSign experience. Once the borrower eSigns a document in Solex, the loan file in Blue Sage is automatically updated with the fact that consent has been received, which triggers the next set of automated steps, such as ordering third party services. Compared to performing these tasks manually, we are taking an incredible amount of work off the lender’s plate. How has working with Docutech benefitted your clients? Any specific stories or anecdotes?Our relationship with Docutech enables our clients to fulfill perhaps the most critical component of a digital mortgage experience, which is allowing the borrower to digitally sign documents online. What’s unique about our relationship, however, is how fast we’re able to do this for our mutual clients. For example, Blue Sage allows lenders to automate the loan application process so that the consumer can shop, price and apply for a loan online, with or without the lender’s assistance. After the borrow completes their digital application, a secure borrower portal is created where initial disclosures are generated and delivered to the borrower to be e-signed through Docutech. All of this automation occurs within about two to three minutes from the time the borrower submits their application. That’s an extremely short time for a borrower to get a loan commitment, and Docutech helps make it possible. What are the most exciting developments you see happening over the next five years?I think the consumer direct technology we’re seeing take off will become commonplace five years from now, but I think we’ll also see an enormous increase in process automation working behind the scenes. For example, every task associated with producing loans will eventually be automatically assigned based on a lender’s volume and the particular skills and expertise of every staff member, including the loan officer. Beyond a continuation of the automation trend, within five years we may see other innovations emerge such as device independence, blockchain, artificial intelligence and further advancements in communication technology. These innovations are already having an impact outside our industry in terms of how consumers access goods and services, and I believe our industry is next. But the most significant advancements for lenders will be technologies that automate human tasks so that the machinery manufactures the loan and humans sell them and advise the consumer. How will you and Docutech be able to help financial institutions reach these goals?Blue Sage and Docutech share the mutual goal of automating everything that can be automated. We’re committed to helping lenders deliver a faster, more intuitive service to their customers while lowering production costs and increasing loan quality. And we’re both obsessed with providing borrowers with a digital mortgage experience. There are still a few hurdles to creating completely digital loans, of course. At the same time, the traditional hurdles to digital mortgages have been peeling away in recent years, while advances such as asset verifications and remote notarizations have taken hold. With Docutech, I’m confident we can help our clients achieve a completely digital mortgage experience for every borrower that chooses it. Finicity, a leading provider of real-time financial data aggregation and insights, announced it has signed an integration agreement with Blue Sage Solutions, an innovative, cloud-based digital mortgage lending platform. Under terms of the agreement, Blue Sage will integrate Finicity’s Verification of Assets (VoA) solution into its multi-channel digital lending platform to accelerate the credit decisioning process for mortgage lenders. Finicity’s credit decisioning solutions allow lenders to free up resources, improve accuracy and reduce mortgage fraud, all while giving borrowers a paperless and hassle-free experience. By partnering, Blue Sage and Finicity can provide mortgage lenders with validated insights of a borrower’s assets in seconds. Blue Sage’s digital lending platform allows mortgage lenders and borrowers to collaborate together in real-time to communicate, exchange required information and track progress. 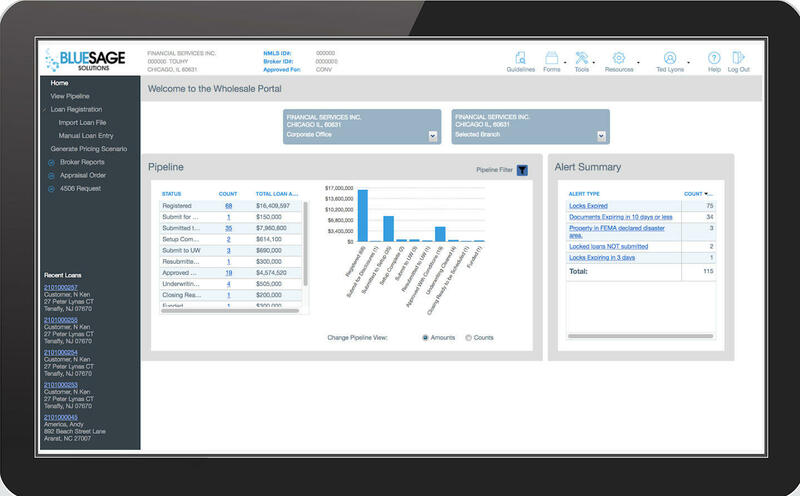 Since Blue Sage operates as a cloud-based platform, both parties can access VoA reports at virtually any time during the process. Finicity is an authorized, integrated provider of asset verification reports within Fannie Mae Desktop Underwriter® (DU®). This gives lenders a certified asset report through Fannie Mae’s Day 1 Certainty™ initiative. Finicity is also part of the Single Source Validation (SSV) pilot, meaning Fannie Mae will utilize transaction data from Finicity reports to validate assets, income and employment. A broader rollout of SSV is planned later this year and will build on Fannie Mae’s Day 1 Certainty initiative. To stay up to date on all Finicity company and product announcements, visit http://www.finicity.com. For more information about Blue Sage’s products and services, visit http://www.bluesageusa.com. Finicity enables a financial data-sharing ecosystem that is secure, inclusive and innovative. Through its real-time financial data aggregation and insights platform, Finicity provides solutions for financial management, payments and credit decisioning in mortgage lending, while also leading the development and promotion of industry standards. The company has developed more than 16,000 bank integrations, with the vast majority through connections that provide access to formatted bank data, improving information access and accuracy. Finicity was awarded API World’s 2016 Finance API of the Year and is a 2018 HousingWire Tech100 winner. To stay up to date on all Finicity company and product announcements, visit http://www.finicity.com. Blue Sage is an innovative, cloud-based digital lending platform for retail, wholesale and correspondent lenders that provides a superior lending experience for every borrower. The company’s technology is 100% browser-based and provides end-to-end functionality for the entire lending and fulfillment process, regardless of channel. All Blue Sage solutions include mobile applications and are delivered through a secure, fully managed cloud service. The company’s technology was developed over the past four years by the founders of Palisades Technology Partners, developers of Impact, the first end-to-end web-based loan platform which was used by five of the 10 largest U.S. originators. Blue Sage Solutions is headquartered in Englewood Cliffs, New Jersey. For more information about Blue Sage’s products and services, visit http://www.bluesageusa.com. Joe Langner is CEO of Blue Sage, Laguna Beach, Calif., developers of a browser-based, end-to-end digital lending platform. He is a mortgage technology veteran with more than 25 years of executive experience in the financial services and software industries, and former chief operations officer at Ellie Mae. He can be reached at joe@bluesageusa.com. MBA INSIGHTS: You came to Blue Sage from Ellie Mae, where you played a role in growing its Encompass loan origination system. What opportunities do you see at Blue Sage? JOE LANGNER, BLUE SAGE: I really enjoyed my time at Ellie Mae and I am very proud to have helped introduce a brand-new product in the marketplace, Encompass, and scale it to the level of success it has today. With Blue Sage, we are working hard to achieve similar success, but there are some key differences. With Ellie Mae, we had the benefit of leveraging our other product offerings, Contour and Genesis, to help increase our speed to market with Encompass. At Blue Sage, our advantage is being able to leverage the more than 30 years of our team’s expertise building loan origination systems for five of the 10 top U.S. mortgage lenders. However, we built Blue Sage from the ground up this time, using our past experiences to include the best features for an LOS and re-thinking ones that should be designed better with newer, modern technology. We also built the solution to be 100% browser based, allowing our customers to realize our features on both desktops and mobile devices. When it comes to functionality, scalability, performance and security, Blue Sage is far superior to other systems–plus it was designed from the ground up to support retail, correspondent, and wholesale lending, including consumer direct all in one platform. PERSON OF THE WEEK: The loan origination system (LOS) is the central “workhorse” of any mortgage operation. It is the “system of record,” or central repository of all critical mortgage data. And with mortgage lenders increasingly adopting the e-mortgage, or all-digital mortgage process, the role of the LOS and the demands placed upon it have changed and expanded. Today’s LOSs sport vastly more features and functionality than the ones of the not-too-distant past. As such, it can be argued that the LOS plays an even bigger role in lenders’ operations than before. Read complete interview on MortgageOrb. Blue Sage Solutions launches a new Digital Lending Platform. Englewood Cliffs, NJ – October 20, 2017 – Blue Sage Solutions, whose founders created the mortgage industry’s first browser-based, end-to-end loan origination system, has launched a new Digital Lending Platform that now serves retail lending and wholesale businesses channels in addition to its existing correspondent lending capabilities. Available immediately, retail and wholesale lenders will be able to sell, manufacture and close loans online while offering borrowers a fast, efficient and user-friendly digital mortgage experience. The Blue Sage Digital Lending Platform Retail Portal enables borrowers with any digital device to shop, apply, and participate in the origination process. Retail lenders can now leverage Blue Sage’s consumer applications to enable borrowers to explore eligible products calculated with real-time rates, fees, and cost options that they can take directly into online application process. Meanwhile, the Blue Sage Wholesale Portal enables wholesale lenders to work more efficiently with brokers and banking partners, and deliver faster loan decisions in an automated and collaborative digital environment. Blue Sage’s consumer applications streamline the user experience by offering full chat and remote assistance and automated workflows. 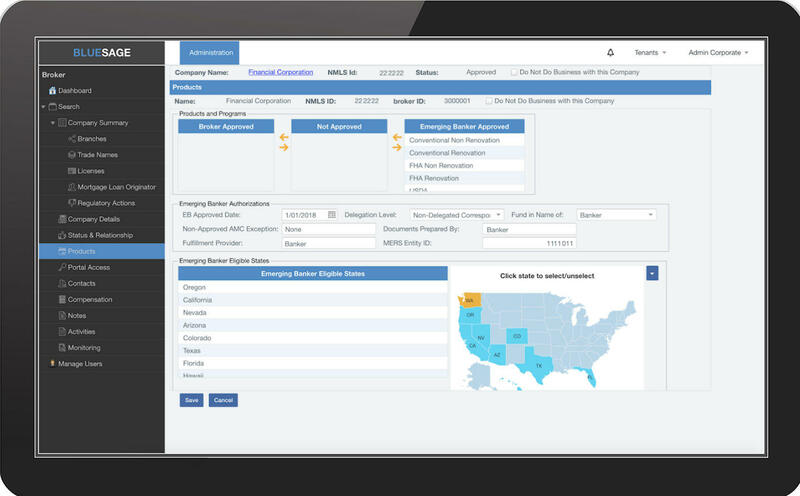 After a borrower fills out an application, Blue Sage verifies pricing and compliance and delivers to the borrower a personalized portal to track their loan progress and receive access to the initial disclosure package ready for an electronic signature. The Blue Sage Digital Lending Platform also includes an Originator Portal and Mobile App that provides key point-of-sale and CRM functionality to set up contact strategies, interact with borrowers, set goals and manage pipelines and performance. With Blue Sage, lenders can increase capture rates, react more quickly to market changes, ensure compliance, and meet borrower demands for a completely digital mortgage experience all on one seamless platform. Blue Sage Solutions a winner in HousingWire Tech100 awards. HousingWire reveals the winners of its fifth annual HW Tech100 awards, recognizing the most innovative technology companies in the U.S. housing economy, spanning real estate, mortgage lending, mortgage servicing and investments. The number of applicants for the 2018 awards increased from previous years and the final list of 100 companies demonstrates the depth and range of technology solutions that are available for those operating in the housing economy. Mortgage rates continued to decline through the spring home buying season, driving up the share of refinance loans and overall closing rates, according to Ellie Mae. In her first policy speech since being confirmed as the agency's director, Kathy Kraninger promised less focus on enforcement actions and more emphasis on consumer education. Northeast mortgage originators relied heavily on referral relationships with attorneys and financial planners and less so with homebuilders last year, the Top Producers 2019 survey found. Destiny USA, one of the largest malls in the nation, is struggling to pay its mortgage, according to a published report.